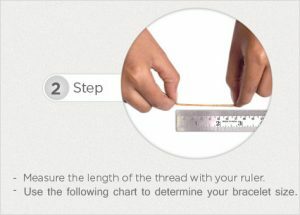 Measure your Bracelet size rightly! The following chart will help you to determine your bracelet size exactly. Measure your hand, you will need a measuring tape or a thread and a scale. Bring your thumb and little finger together and measure were your hand is the widest as shown in the picture.